Stay in a 300 year old stone farmhouse deep in the Italian countryside! 5 spacious apartments with 9 bedrooms, en-suite bathrooms, kitchen & dinning rooms in each apartment, wood beam ceilings, tile floors and stone fireplaces! 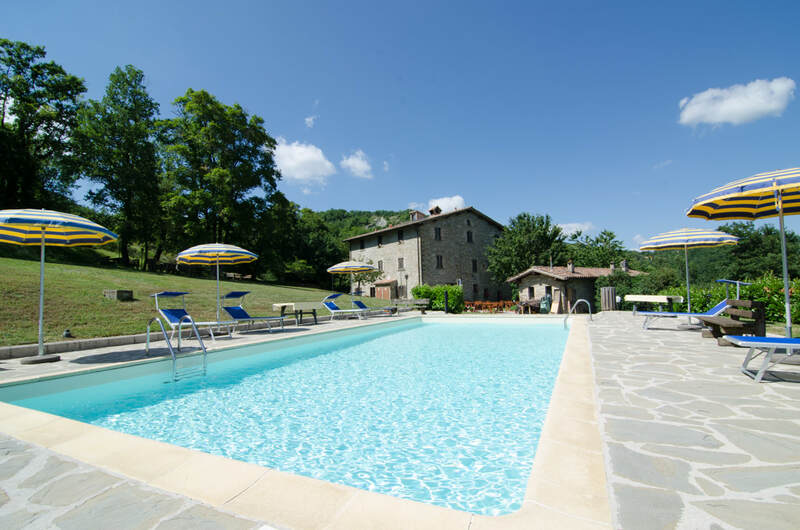 La Tavola Marche Agriturismo & Cooking School is located in Le Marche, between the Apennine Mountains & the Adriatic Sea, offering a pleasant farm holiday on 250+ acres of picturesque rolling hills and farmland in a truffle-rich valley. Guest accommodations are in our 300 year old stone farmhouse with spacious apartments with private bedrooms, en-suite bathroom, kitchen, dinning room, wood beam ceilings, tile floors and stone fireplaces! Explore the sprawling hiking trails or relax by the pool, in a hurry to go nowhere. The famous white & black truffles are found on the property and if you are lucky enough to visit in the fall, you can taste its unique flavor. The surrounding wooded areas are perfect for those who enjoy excursions into the forest to gather wild berries, delicious wild mushrooms, or even participate in the search for fragrant truffles under old oak trees with the guidance of an expert truffle hunter. We combine searching for the best seasonal local ingredients, hands-on cooking classes, and the conviviality of the table to help you connect with the people through their food, culture, and land. La Tavola Marche combines the almost untouched nature with local cuisine and modern accommodations. The produce is all grown in our organic garden, we cure our own meats & make our own liquors, preserves & jams. What better place to relax than the undiscovered Le Marche, nestled between the Apennine mountains and the Adriatic coast. The area is filled with medieval hilltop towns, green pastures and time-honored culinary traditions. The property is beautifully restored with wood-beam ceilings, tile floors, numerous fireplaces, and a large open kitchen and dining room completing the rustic ambiance. You can join fellow guests for dinner, take a cooking class, or cook for yourself in your apartment kitchen. Five-course feasts are served in our rustic kitchen or dinning room in the winter and in the garden terrace in the summer. La Tavola Marche marries the enchantment of untouched nature and a land of magically unique culture with the comfort of modern accommodations, complete with all the features that are considered eco-friendly. Our guests enjoy the local specialties that Chef Jason prepares daily based on what is in season. Breakfast is available by request and includes coffee, tea, juice, pastry, fruit, cereal, local honey & homemade jams. Five-course feast - all made by hand, in the house from our farm, 4+ plates of antipasti, primo, secondo, contorno (vegetables), dolce, caffe & digestivo. Lighter dinners & childrens pricing are available by request. Get settled in nicely with a basket stocking your room with the essentials. All meat, cheese, wine, honey & fruit are locally made/grown. A Good Start | 25 Euro | Bottle of your choice: Prosecco, house bottled Montepulciano (red) or house bottled Verdicchio (white) with a platter of homemade meats, cheeses & fruit for two. Enjoy in your room or in the sun.